Hello people and thank you for being here. When I started sharpening knives I had no thought of anything but sharpening them and that is true of almost all people who sharpen probably. 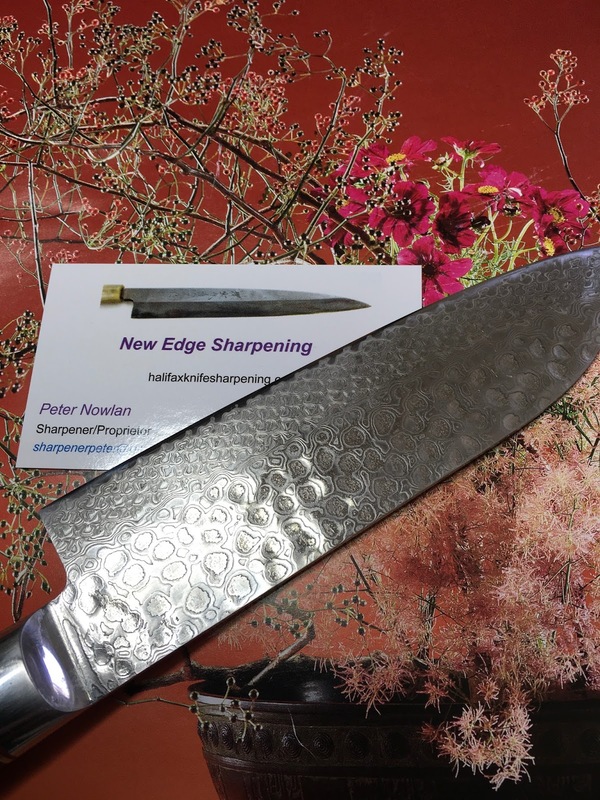 I suppose a better way to put this is that if I was just sharpening my own knives, over and over for many years I would know what was in store. When I became a professional sharpener that all changed, the first batch of knives I had contained a knife with a broken tip and now, fifty percent of the knives I get have some type of damage. So the sharpening is actually the easy part in most cases, it is dealing with the other parts of the knife. 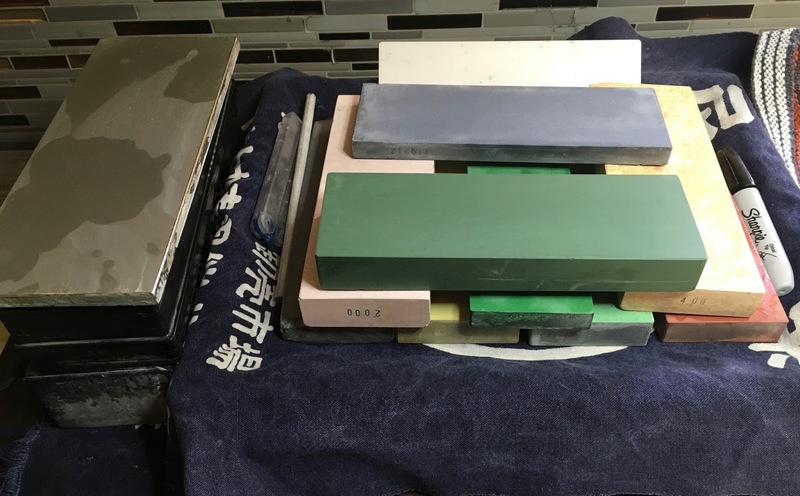 Something I learned from Kevin Kent of Knifewear was the approach of making the knives that come in for sharpening look like they did when they went out, as new knives, so I work towards that now. I can't always make a knife look exactly like it did, that is impossible but I can make it perform at least as well as it did but usually better. 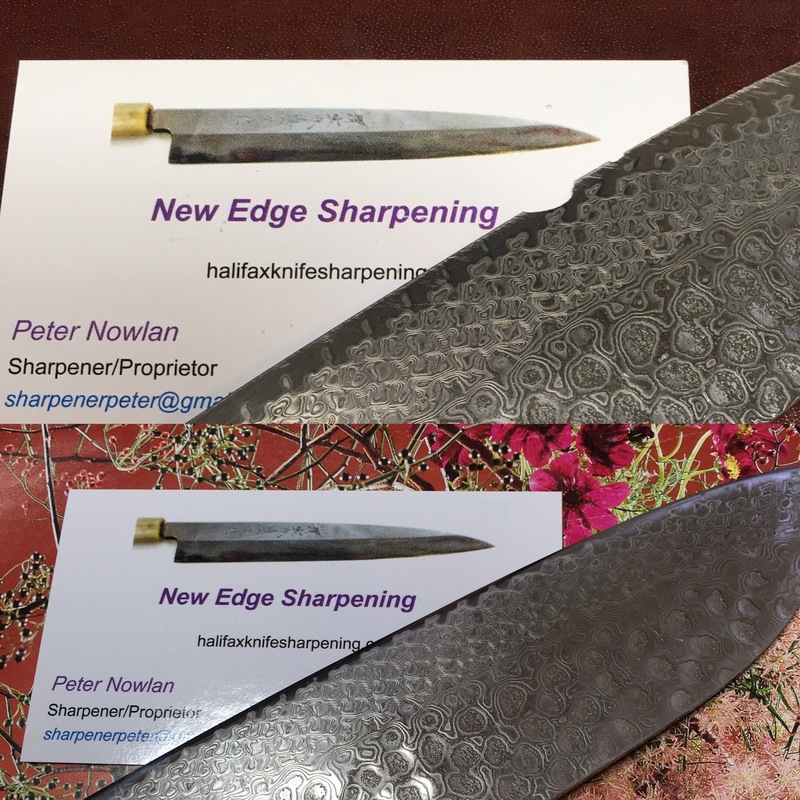 Sometimes the damage is severe enough to involve a significant level of metal removal along the primary edge which moves that edge up into the thicker part of the blade. So to fix that, it is more than just making the edge straight again, i.e. with no chips but it has to be thinned out as well, or it should be. I like doing this work, it is very rewarding. Here is a knife that came in recently and I had to fix it up prior to sharpening it. When I get this amount of damage, I have a couple of options, very coarse water stones or my belt sander with the awesome Trizact sharpening belts. In this case I used the belt sander to remove metal along the edge efficiently until the hole disappeared. I can do the work very nicely this way and although I can use the stones as well, this is quicker. Once I get to the point where that new edge is formed, I stop the work with the belt sander and shift to the water stones and I always start with my most coarse stone which is now a 180 grit Naniwa. It isn't good enough to just sharpen the knife, yes it would be very sharp of course but it would not be as thin as it was when it was new so I have to thin it first. I do this by grinding metal at a very acute angle, the knife is basically laying flat on the stone but I am careful here. 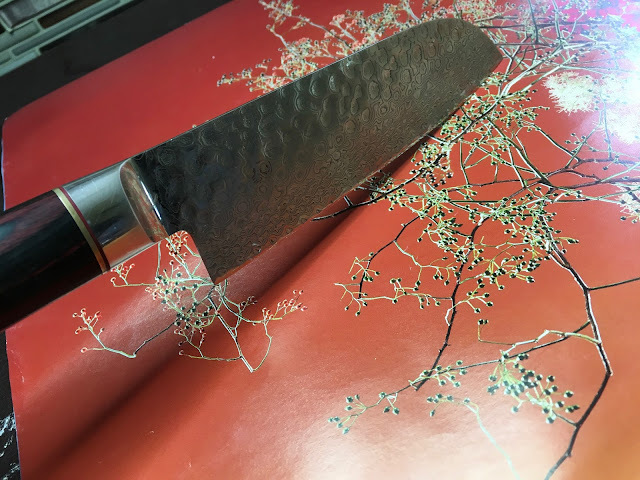 I don't want the stone to scratch the blade, especially this damascus pattern so I lift the spine just enough to clear the blade, it is a degree or so. I shift from coarse to finer stones at this Thinning Angle until I am satisfied, the knife is still dull at this point. Then I just raise the angle to my sharpening angle which was 15 deg for this knife and then I sharpen it. If I did all the work by hand, I would be doing the repair work with the knife held at an angle such as the one in the bottom picture, almost 90 deg and then I just grind on a coarse stone until the metal is removed enough to get to the bottom of that hole that was in the edge. I shift from about 80 deg on one side to 80 deg on the other side to raise burrs on each side. This process is something I repeat about twice a week at the very least, sometimes every day. I am always nicking my leather strops with the knife, no matter how careful I am. But also, my edges are passing over the surface of that strop about 100 times a day. 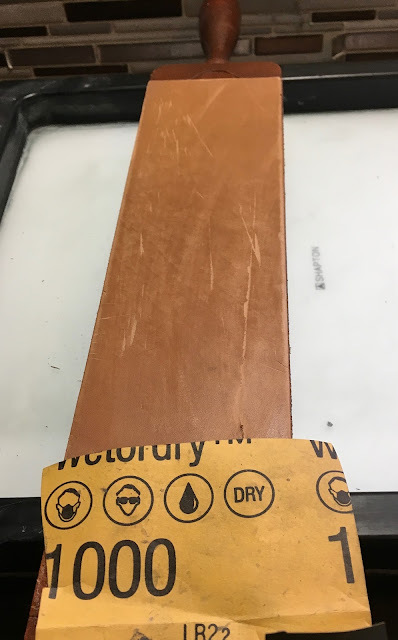 I found that using some very fine sandpaper on the surface can smooth out those rough spots that I make, extending the life of the strop. It is just a matter of being very gentle and it doesn't take long at all. It will change the colour of the leather but that's fine with me.